This is almost the meal that changed my life. Until a few years ago I considered any food that wasn’t plain boiled pasta disgusting. I was completely disinterested in anything that wasn’t beige and flavourless. I went to University and had to start fending for myself so a few more exciting things crept into my culinary repertoire; a little melted butter on my pasta for example. I know, exotic. I suppose I was what you would call a late flavour bloomer; I think my olfactorary centre and taste buds started to develop with my wisdom teeth. Indeed not only had I grown some physical wisdom I also had some previous culinary knowledge on which to build, and now, more teeth to eat things with. I have always cooked; biscuits with my Granny, cakes and pastry with my Mum and barbeques with my Dad but it wasn’t until 2008 that I really started to experiment. At University you become extremely good at procrastination. One of my favourite time wasters was trawling the internet looking for cookbooks. For someone who found flavour offensive I had a pretty large collection of cookery books; I found great pleasure in cooking for others things that I wouldn’t touch with a bargepole. I came across a particular cookery book that sounded pretty good to me; it was over 500 pages long which is a lot of bedtime reading. I ordered it. What I didn’t know when I ordered it was that it was a book about vegetables; pages and pages of green, red, orange and purple things which were all alien to me but they were organised alphabetically so I liked that. There was one particular recipe that caught my eye, mostly because it seemed cheap. It was green beans with roasted tomatoes. I made it and the textures and flavours were like nothing I’d ever had; the beans were still slightly crunchy and squeaked when you chewed them, the tomatoes were sweet but also acidic. I probably ate more beans at that moment that I had ever eaten cumulatively in my life before. It’s now four years later and I have a vegetable patch. I get more excited about the prospect of the Jerusalem artichoke season than most people would think healthy. I am constantly on the search for new fruits and vegetables like a botanical Christopher Columbus. My parents were at their wits’ end when I was growing up but they always encouraged me to try new things. They said I’d thank them one day; I can’t thank them enough. As you may have seen from the photos above I have grown my own chilli for this recipe. I believe the variety is ‘Violent in Violet’ however I may have invented that name from nowhere so don’t quote me on it! This is the only chilli I had this year, I’m still hoping for another but I won’t hold my breath. Slice the tomatoes in half, put in a baking tray and then drizzle with olive oil, white wine vinegar and salt and pepper. Put these into then oven at 220C for 15-20 minutes or until slightly blackened at the edges. While the tomatoes cook remove the broad beans from their pods and the peas from theirs. Cook the broad beans and peas in a little salted boiling water for 2-3 minutes. When done, drain them and squeeze the broad beans out of their grey skins. The easiest way to do this is to make a little slit in the side of the case with your fingernail and then squeeze it out. When the tomatoes are done put them into a blender with the chilli and blitz into a chunky sauce. 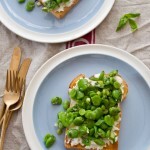 Put the peas, broad beans and sauce onto a plate and crumble the feta cheese on top. This was lovely because the spicy tomato sauce and cheese sort of melted in to each other and the beans and peas were wonderfully sweet and crunchy. 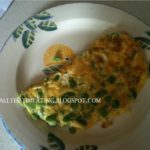 If you’ve been reading this blog for a while or if you’ve just started you might have noticed that my food revolves around fruit and vegetables. I can’t imagine a life without fruits, vegetables and the seasons that bring them. Things have certainly progressed in four years but I do always wonder what would have happened if I hadn’t ordered that book. This post gives me hope about my little one. He only likes to eat boiled pasta with olive oil, and does not seem interested in flavors. This dish is fresh and full of colors. The feta cheese is perfect combined with vegetables! I was the same when I was younger! Yum, this looks so tasty, I’m going to have to have a go! I once tried to nurture a chili plant, but no such luck for me. Simple and spicy vegetable recipes, like this one, are great. I’d have to say I was a late culinary bloomer too. Like you, I was a big fan of pasta, but lets load on some cheese, eh? 🙂 I am glad we have both discovered the absolute joy of flavored food! This recipe is gorgeous, healthy and looks absolutely delish!! I like the story. I have always cooked but only in the last years I really developed it. I grew chili last year but they died this year when I ried to put them outdoors. Great dish, simple, clean flavours and it looks very tasty. 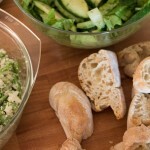 Great sharing and I never really fancied these type of salads during my younger days. My mum never prepares such because her cooking was mostly typical Indian cuisine. Now that I cook for my family, I would love to have more of salads and this recipe of your is simple and will be great to go with a cup of hot soup to compliment each other. Any kind of life-changing meal is worth trying! I am excited to share in this blog world with you! Yay for making new blog friends. This looks delicious! My life revolves around fruits and vegetables too. I try to avoid meat in my cooking if I can. I do alot of vegetarian dishes on weekends…and I love tofu! A perfectly colorful summer dish! If I can find some terrific local peas (they exist but cost a fortune), I would make something just like this. I loved that post! I was always a picky eater with a restricted diet. Part of that was being forced to eat the dreaded school meals….it wasn’t until I started to cook for myself that I realised food could be amazingly good. Well done on finding a great recipe to kick start your food experimenting! Your comment about how going off to Uni changed your eating habits raised a smile here. Our girls were just like that. Now they are both really interested in food – and good cooks too. I love that this is so light, colorful and I know it’s delicious! Great recipe. A “Botanical Christopher Columbus” indeed! What an inspiring story:) I really need to choose my healthy dishes more carefully. Yours looks like a great way to start!!! P.S. Caroline, I just became your newest Pinterest follower!!! Thanks! i love this post! 2008 was also a big year for me – i started cooking. before that, i was totally fine with prepackaged foods and eating out. and this dish is just exquisite! Like your idea of seasonal eats..
First time here… glad to follow you..
check out my space when you have time…like to be in touch with you..